On Day 6 of the Royal Tour, the Duke and Duchess of Cambridge visited the Waikato region of New Zealand, covering the towns of Hamilton and Cambridge. Upon arriving at Hamilton airport, the royal couple went separate ways. William visited the Pacific Aerospace Centre at the airport, while Kate attended a tea party at the Rainbow Place Children’s Hospice. 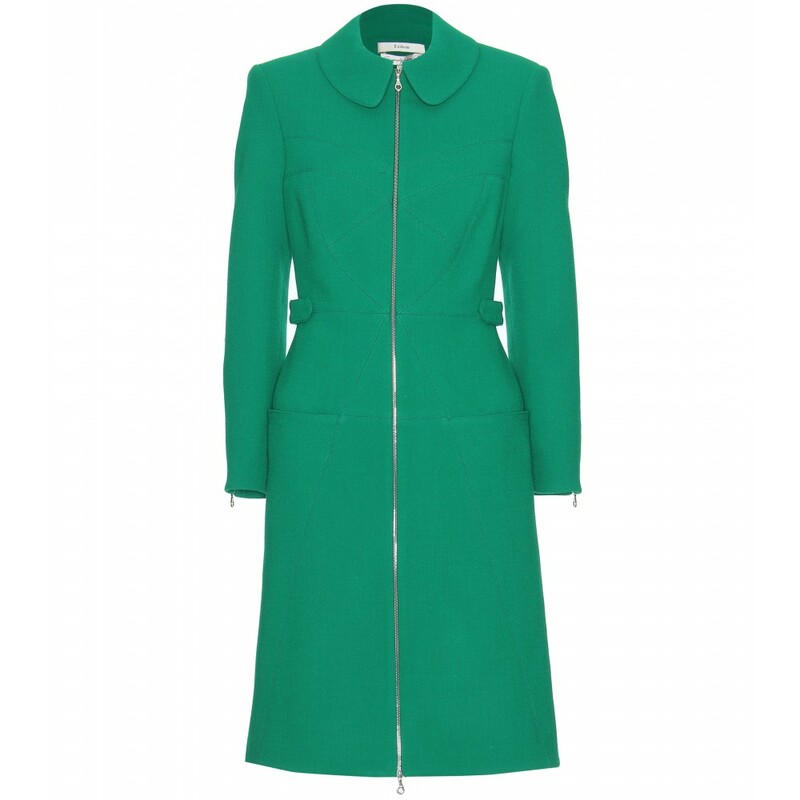 Kate wore a bright grass-green coat by Erdem, featuring a zipped front and Peter Pan collar. The sleeves have matching zipped cuffs. The US$2500 coat is fabricated from 100% wool-crepe and is detailed with a tab waist and front pockets. We managed to get a glimpse of the dress Kate wore under the coat. It was a tea-length frock by London-based designer Suzannah, called the 'Budding Heart Silk Tea Dress'. The dress is tailor made in England and features a beautiful white budding heart print onto green Italian silk crepe de chine. The smocking detailing at the shoulder and under the bust add a wonderful vintage charm, with the bias line of the skirt skimming to below the knee. It is currently in stock and retails for £475. She accessorized with her black suede Episode 'Angel' pumps and her Mulberry 'Bayswater' clutch, also on black suede. Kate coordinated her green ensemble with her emerald and diamond drop earrings, first worn in November 2011 when she attended the opening of the Natural History Museum Treasures Gallery. We also see her wearing the Cartier Ballon Bleu watch. The royal couple reunited in the afternoon to officially open the Hamilton Avantidrome velodrome, a state-of-the-art cycling arena. The organisers presented them with a gift for Prince George, a bespoke Avanti Lil Ripper bike. You can read further details of today's events on the official website of the Duke and Duchess of Cambridge.